DOCTOR WHO - Redeeming The Twin Dilemma | Warped Factor - Words in the Key of Geek. Dominic Fellows offers up some suggestions on how we might just redeem The Twin Dilemma. ‘The Twin Dilemma’ had an uphill struggle before it was even broadcast. 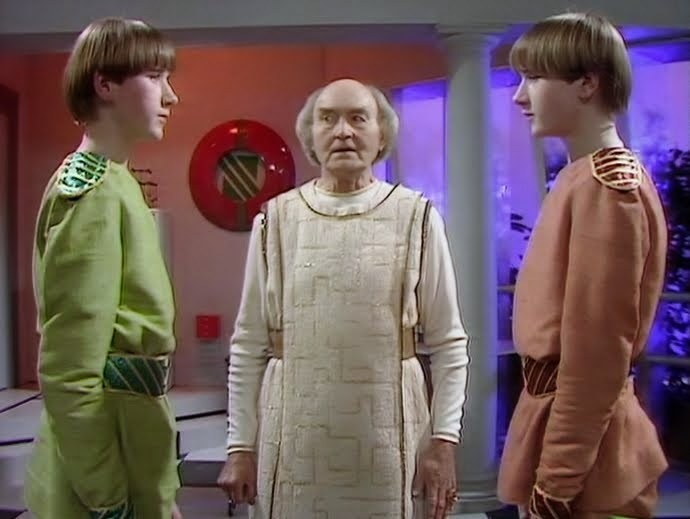 It had the unenviable task of following ‘The Caves of Androzani’, closing season twenty-one, introducing a new Doctor and being a good story in its own right. That would be a tall order for the greatest story ever written, difficult for something even slightly below par and nigh on impossible for something that frankly, isn’t very good. But could ‘The Twin Dilemma’ be saved? Taken out of its time and given a modern make-over could it become something not quite so loathed? Like all Doctor Who ‘Dilemma’ is not without some merit. The idea of an unstable, unlikeable Doctor is at least interesting and had it been explored in greater detail, and at the beginning of a season rather than the end, it could have come as close to psychological drama as Doctor Who has ever had. I’m not saying Doctor Who should be a psychological drama, but it does have the scope to be and that’s what matters. 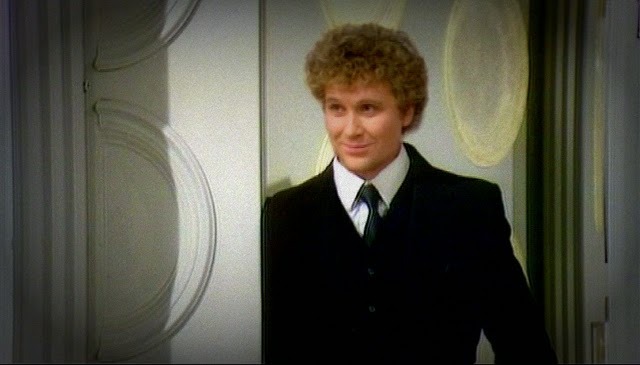 I’ve always thought it’s a bit mean to dislike the Sixth Doctor in this story. He has just suffered a fatal disease had a complete psychological breakdown and we expect him to carry on as normal. It’s rather like chiding someone for having a mental illness. Maybe I have a slightly evil streak, but it never bothered me. I was always drawn to the Doctor because he had this darker side. I always just accepted he was going through a trauma and assumed he’d be well by the end, which he is. ...but I’m inclined to be charitable on this occasion in an attempt to offer some sense of logic to it. 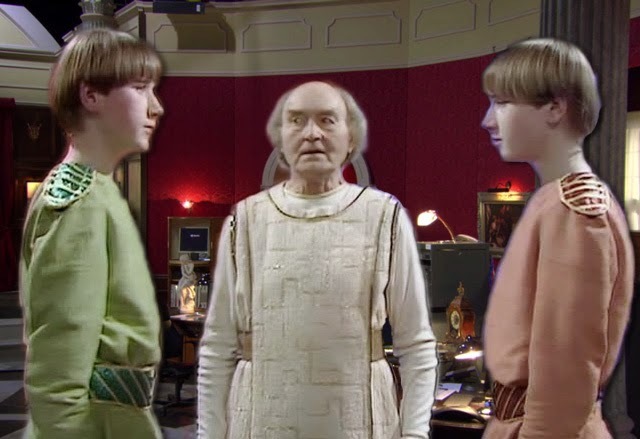 It’s at least possible that The Doctor’s perception of colour is entirely different to our own. Where we see clashing colours perhaps he sees beautiful co-ordination. 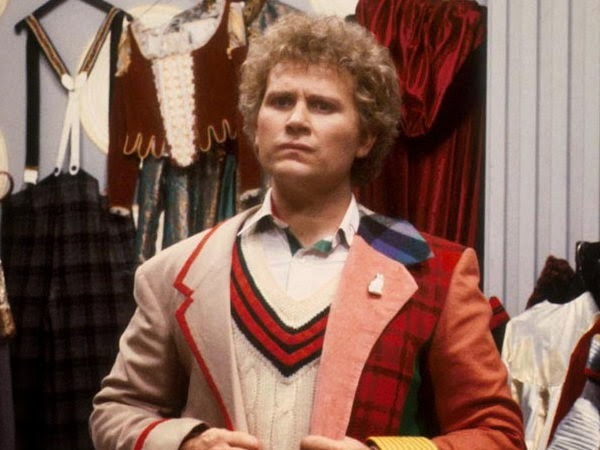 I always felt that a patch-work coat is not actually a bad idea, but it should look like just that; a patchwork, carelessly cobbled together from bits of his old wardrobe, the problem with the Sixth Doctor’s coat lies not perhaps in its multitude of colours but that it looks far too tailored and stylised. I choose to make the assumption that it was carelessly cobbled together on Gallifrey by someone who just happened to be really, really good at textiles. When the Sixth Doctor wandered into the background in ‘The Name of The Doctor’ it was amazing to me how out of place he didn’t look. 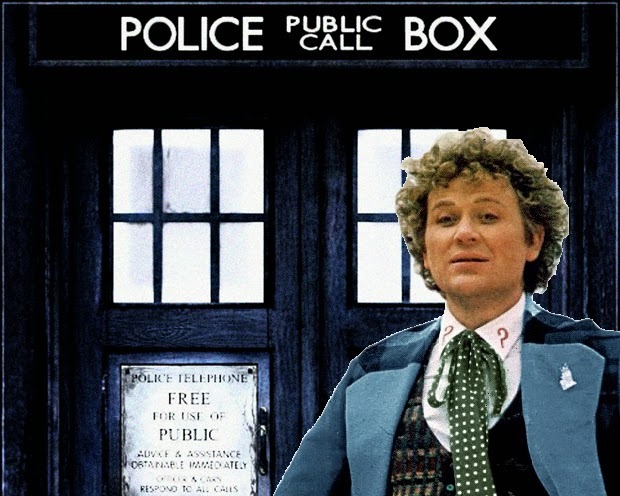 Doctor Who is so big and bold these days that the Sixth Doctor’s costume seems to fit in reasonably well. Another theory of mine is that it is made of ‘Mimosian mood fabric’ and changes colour to suit the personality of the wearer. After all it turned blue for a time. It’s better written than anyone gives it credit for. Ignore the plot, which is both barmy and simplistic in equal measure and look at the pure mechanics of the scene construction. Within seconds of meeting Azmael and little more than two sentences being exchanged we learn the following; The Fourth Doctor visited Jaconda and liked it so much that he not only stayed there (The Doctor stayed somewhere!?) but indulged in an uncharacteristic all-night binge session with a former mentor and friend and got so drunk he pushed said mentor into a fountain so that he might sober up. This is not the mark of a weak writer. One suspects that Antony Steven was much more used to writing plays as despite the odd dialogue triumph, most of it get lost under a nonsensical plot that spends far too much time concentrating on the wrong thing, The Doctor’s instability fizzles out half way through having not been properly addressed to be replaced with a ridiculous colonisation of the universe thread. If only this had been down played and the instability played up, this may have worked as character drama. Then there’s the lightning. 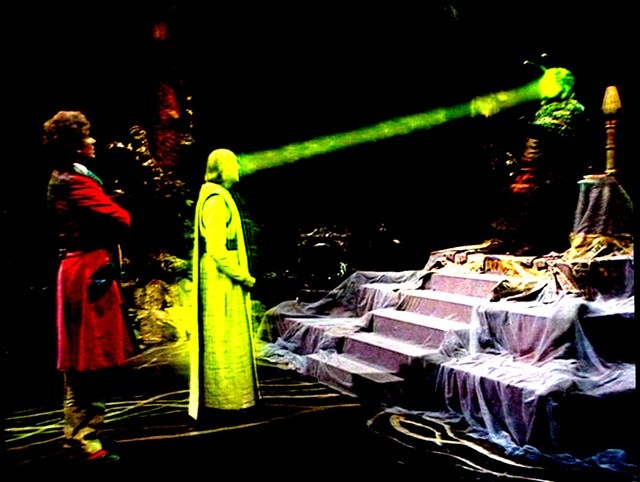 After the moody atmosphere of ‘Androzani’ and evidently not content enough with the most garish set and costumes the show ever had, the production must have been thinking ‘do you know what this needs? 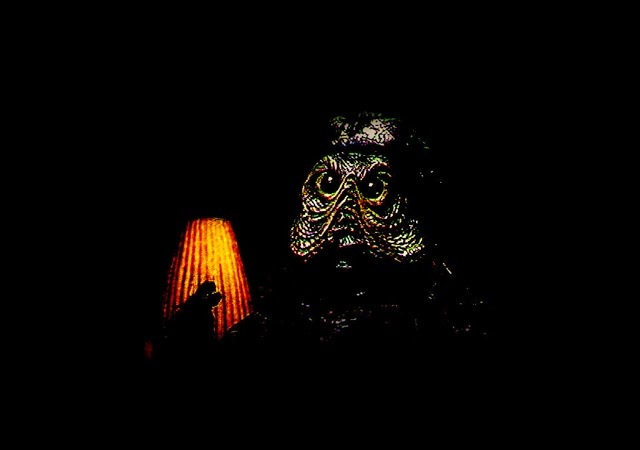 Floodlights!’ The lighting in ‘Dilemma’ is so bright it tends to strain the eyes after one episode. This is a problem that today you could fix with digital grading. Imagine Jaconda with wonderfully muted and de-saturated colours to depict the wasteland it has become, or the lights in Mestor’s chamber taken right down to make it look like the dank slug-pit it’s supposed to be and drawing attention away from Mestor’s costume into the bargain. The music doesn’t help either, largely resembling the sound of someone banging their against a keyboard. Imagine Azmael’s death scene being played out against Murray Gold’s majestic ‘Girl in the Fireplace’ score or the eerie ‘Impossible Planet’ horns introducing us to Jaconda and it’s all just that bit more effective. And it’s not as if the cast are bad either. 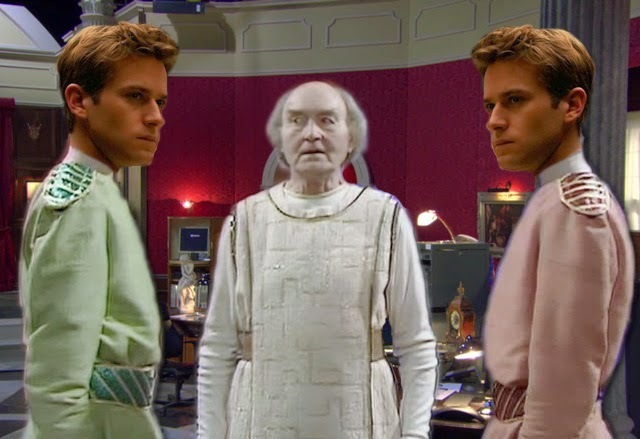 Maurice Denham was an immensely distinguished actor, Kevin McNally would go on to star in ‘Pirates of the Caribbean, Barry Stanton was a well-known stage actor and Edwin Richfield was known to Doctor Who fans for his excellent portrayal of Captain Hart in ‘The Sea Devils’. Unfortunately there are a handful of actors who let the side down so badly it’s like watching an amateur panto. The most irritating thing about this is that these characters do little more than reel off exposition such as Fabian ‘this is something I’ve always feared’ said in a manner that suggests less fear and more ‘This is something I’ve occasionally been mildly concerned about.’ Or the awesomely bad delivery of the un-named Jacondan who claims ‘She was with a man. We left him half dead.’ Said with all the passion not so much as ‘half dead’ but ‘momentarily inconvenienced.’ The eponymous twins are equally unforgivable. They would perhaps have to be re-dubbed by boys who could actually act to make them passable. Or have their scenes severely trimmed so they only uttered the bare-bones of their dialogue. If the dull and unnecessary scenes were cut not only would things move along more quickly, but much of the abysmal acting could be removed. So as it stands ‘The Twin Dilemma’ fails on just about every level, however hidden amongst all the mess is a half decent story about an unstable Doctor, coming to terms with his most traumatic regeneration to date and also embracing his alien heritage. His final words to Peri in this story are ‘wait a little before you criticise my new persona. You may well find it isn’t quite as disagreeable as you think; whatever else happens I am The Doctor whether you like it or not.’ A fitting mantra for any of The Doctor’s ‘new face’ adventures. 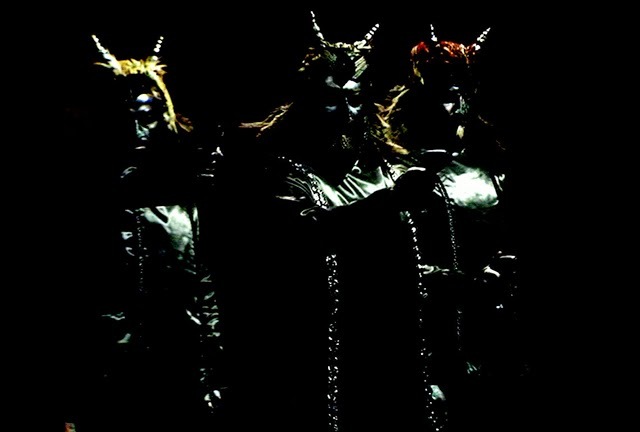 So if ‘The Twin Dilemma’ were re-mastered, re-edited, re-coloured, re-graded, re-dubbed (in places) and re-scored you never know; it might actually be just about okay.